Today Obama signed into law the Hate Crimes Bill. Inclusive of gender identity. Groundbreaking stuff, I tell you. And not an easy path. I have yet to hit the airwaves, so to speak, to here from those who decry this action. And yet I can’t help but honor those who have given their blood (literally), sweat, and tears in the fight to bring this bill to fruition. For that deep courage, thank you. My own little guy’s fight against stereotypes, while certainly not as monumental, has definitely hit some bumps of late. Hence the many questions I’ve posed here. It’s been wonderful hearing from you. Those of you just stopping by for the first time (thanks NY Times parenting blog commenter for the mention! ), welcome, and please do join in the conversation! He has a new conviction behind his choices, and I so love that about this boy. He’s learning a bit more about what it means to stay true to his own likes and beliefs, and that will surely serve him well in life, whether it’s about what he wears, who he hangs out with, what he does for fun, or what he does for work. And, this journey does take courage on his part. And brings some sadness and frustration on his part (and mine/ours). But I’m thinking that today’s signing of the Hate Crime Bill is a fine example of where these little acts of courage can get us. And I know that my boy’s courage will get us far, too. All it takes is love as the lens! Alas, I have to agree with this sad parody. Not that I don’t think Obama isn’t busy with very important issues. But somehow the queer community, the “queer issues,” are so often shuffled and reshuffled to the bottom of the pile. Again and again. I see it happening with Prop 8 and very much so with Don’t Ask Don’t Tell (which I believe Obama could at least suspend on his own WITHOUT an act of Congress). So I support this courageous president, but I think he needs to up the courage quotient and be courageous in some areas that involve stepping out on a proverbial political limb. 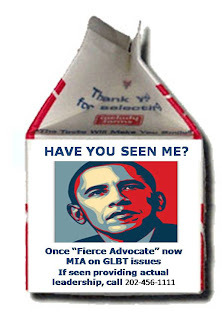 Thanks to LesbianDad for pointing me in the direction of this lovely milk carton. I added a new page (up top there — a tab at the top of the page) about why I occasional sprinkle political thoughts on a blog that is often more local and personal. Have a look. Let me know what you think. I posted over at my other, oft-ignored blog today. It’s about community, which relates to this here blog. And politics. Which does, in a one-step-removed kind of way. And voting. That link you’ll have to make on your own. Come on over for today.